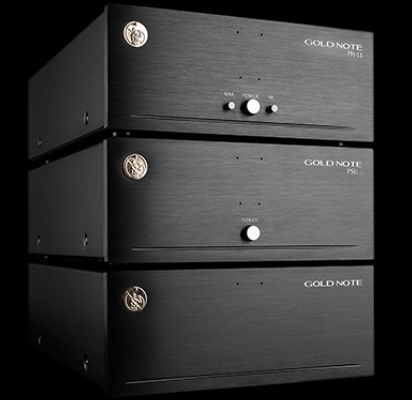 New Gold Note PH-11 phono stage . EX-DEM IN VENDITA EURO 3000. The new PH-11 is Gold Note’s flagship reference MM/MC phono preamplifier featuring a high current battery power supply with automatic temperature stabilizer to produce the best audio performance. It is a fully-balanced three-chassis unit with four batteries and an intelligent charging power supply. This massive power supply is able to release great dynamics with any kind of phono cartridge. The extremely silent background, enabled partly by the use of batteries, allows the unit to amplify phono cartridges with outputs even lower than 0.1mV with ease producing magnificent audio quality. The PH-11 features Gold Note’s proprietary fully balanced four times dual-stabilized mono amp design stage. The unit enables easy MC phono cartridge matching and can be supplied with two pairs of loading plugs to find the perfect match in any condition. All phono cartridges with an internal impedance below 10 ohms would normally need an external step-up transformer. Compared to the best step-ups the PH-11 retains focus and definition at the frequency extremes rather than going slightly out of focus and is extremely detailed. It works well with all MCs while a step-up can produce enormous variations in sound quality if output and loading are not spot-on for a given cartridge – completely choking the quality of a good MC. Gorgeous Mediterraneo Turntable by Gold Note.